Hitomi went down last year in October and rode along the Historic Columbia River Highway and instead of spending my weekend doing the RASPsody bicycle ride we decided to make a weekend of touring. We rode from Portland into Cascade Locks, spend the night at a Best Western, and returned via Washington State Route 14. Hitomi wanted to ride her road bicycle, which she hadn't for a few years, and so I had to carry all the luggage. Since my road bicycle has no rack (or braze ons for one) I took my singlespeed bicycle with a rack–with trepidation. Climbing some big hills isn't a big deal if the grade isn't too bad but it still is a lot harder on the legs. Adding in 30 pounds of stuff, though, it actually turned out to be not as bad as I had feared. We took the train to Portland. I spent most of the time playing Gyakuten Kenji (in Japanese) and listening to music. And eating food we had brought on board. From in front of the station, we cycled toward a quiet brew house called the Tug Boat Brewing Company, me trying to remember back the directions given to me by a pedicab driver. So after finally setting out, and after being on light rail for about twenty minutes, it was already getting into lunchtime and weren't to our first waterfall yet. I hadn't seen any of the famous Gorge waterfalls except in pictures and in movies. Hitomi and I bicycled and hiked to see about 8 of them and hopefully we captured a few decent pictures. Without much of a hiking guide it was kind of hard to figure out where the trails actually went to, since there was a surprising lack of information at any of the trail heads. With such a large number of tourists, you'd think the place would be replete with signage. But instead it was designed perhaps intentionally to discourage casual hikers. In places you'd normally see a trail map there was almost no information about the actual place. So we hiked in a fair bit more than I would have liked. It was getting late and we had to finally hit the road. Cascade Locks was a town built around some (once) important boat locks. The park, the site of the locks, talked a bit about the history of the construction project, which turned out to be quite an arduous 20+ year project. None of the interpretive material mentioned why the locks were no longer necessary, failing to mention that the whole project was rendered moot by the construction of the Bonneville Dam 40 years later. The town seems to carry on as a tourist destination. We had dinner at a decent cafeteria-style dining place next to the hotel. Hitomi ordered salmon, which she said was good last time. My mistake: I ordered a "pulled pork" sandwich, whose meat resembled sliced deli meat (ham) bathed in BBQ sauce. The pie was pretty good–how can you mess up pie?–but then the a la mode arrived as soft-serve ice cream. Day two: We had breakfast (again) late, in their free continental breakfast room, which was actually supposed to be closed but we got in anyway. Around 11 we crossed over the Bridge of the Gods, which is pretty scary like I've heard, since the road surface is just metal grating and not easy to bike, especially in the cross wind. Then it was mostly rolling hills and a few small breaks until the climb up Cape Hope, which you see in the photo above, where we took pictures. It seems like the local Asian community groups (churches, youth groups, etc.) are into touring the area as all the large tourist groups were Asian, including a bus of Japanese students. (I wonder why all the immigration from South Korea–is it really bad there?) Anyway, there I was at the railing, adjusting my genitalia as you must with bike shorts, and a moment later is a girl with a digital camera pointed my way through a truck window. Past Cape Hope, and down into Camas, the scenery turns to crap and the highway fills with traffic. Yes, bicycling along a busy highway through suburbia is just as unpleasant as you might expect. Eventually we get off and go along a poor surface old highway which is a little nicer in some ways and make our way to I-205. Now supposedly there's a bike path from I-205 over the Columbia but I couldn't figure out the map, and end up (with Hitomi) on the bridge deck itself, in the shoulder of course, but I get the feeling I'm in the wrong place. Luckily this part is over quickly but there's quite the interchange near the airport and it takes a bit of work to get on to the real I-205 bike path. By this point, Hitomi's tired and she gives up, taking light rail into downtown. The train arrives back in Seattle on time (for once) and we ride back home, satisfied. 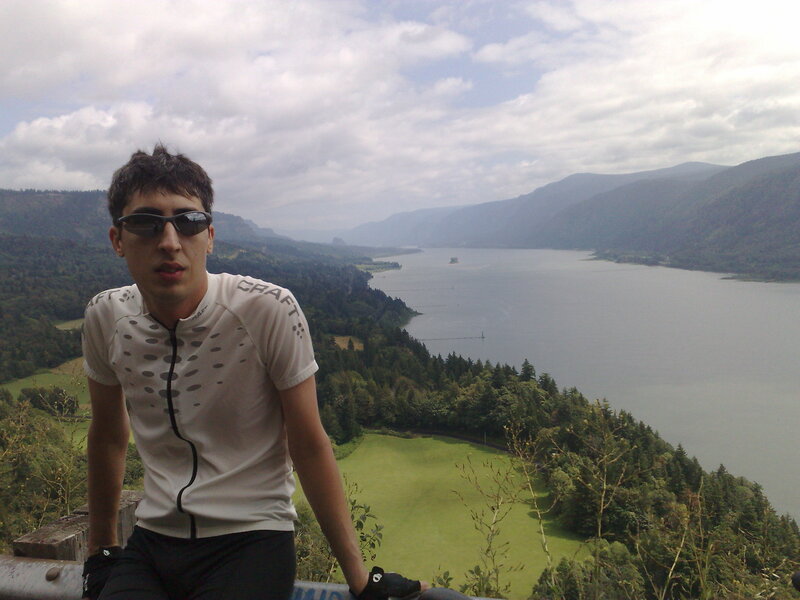 This entry was posted in Uncategorized and tagged columbia river, gorge, portland, seattle. Bookmark the permalink.